TV Listings from January 7, 1967, the final Saturday that "All Star Wrestling" live from Roanoke aired on WDBJ. 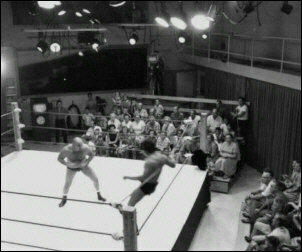 For the better part of the 1960's, WDBJ in Roanoke VA presented a live program called All-Star Wrestling on Saturday afternoons at 5:00 PM, in advance of the live event later that night at the Starland Arena. 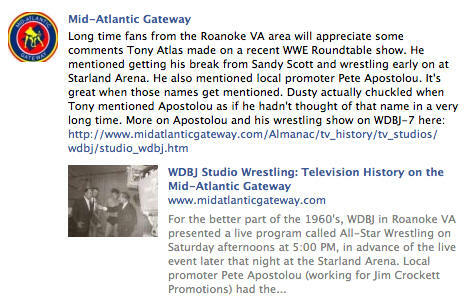 Local promoter Pete Apostolou (working for Jim Crockett Promotions) had the perfect set-up where the guys could come in and do the live All Star Wrestling TV and the Starland Arena show all within hours of each other. It was one of the highest rated programs in the market on a weekly basis. 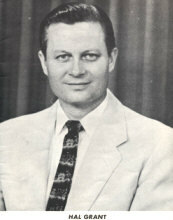 The show was hosted by WDBJ personality Hal Grant. Johnny Weaver told us that WDBJ cancelled the show following an ugly incident between Ike Eakins and Luther Lindsay. 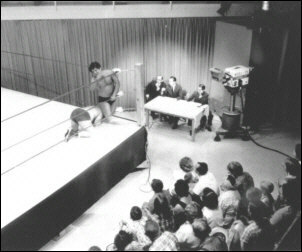 Not long after, Mid-Atlantic Championship Wrestling hosted by Bob Caudle debuted on WSLS-10 in Roanoke VA, although for many years, they still ran the old All Star Wrestling logo over the Mid-Atlantic opening, which included two cartoon wrestlers and the introduction which announced the program presented by the Roanoke Sports Club. 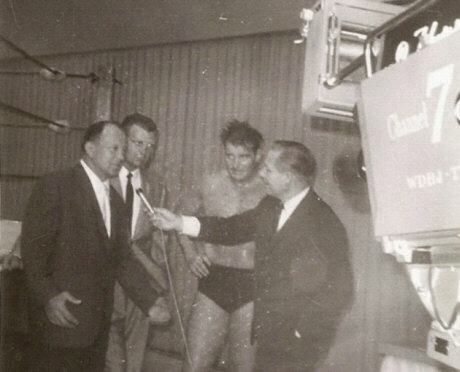 Promoter Pete Apostolou also did the inserted 30-second local promos until they began the 2:30 second spots taped in Raleigh for each local market. 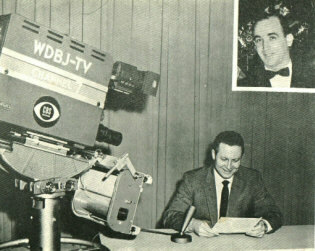 in the television studio at WDBJ-7 in Roanoke VA, circa mid 1960s. just after it was built. 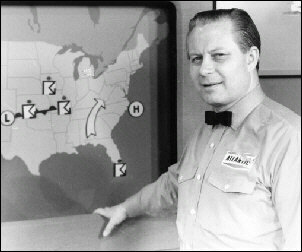 Also, wrestling host Hal Grant doing the weather at WDBJ. 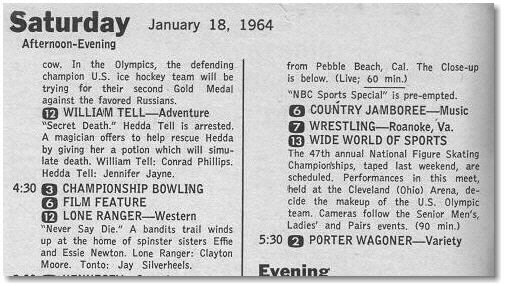 A TV Guide clipping from January 1964, showing All-Star Wrestling in it's familiar time slot of 5 PM. Notice the designation of Roanoke VA, something rare in the TV guide listings. A clipping from the 8/26/60 Danville VA newspaper that promotes an appearance by WDBJ's Hal Grant. it is the earliest reference to wrestling on channel 7 we have found so far. Special thanks to Thom Brewer, Mike Weddle, Sandra Scott, and Carroll Hall at WrestlingMemories.com for their assistance with this feature. 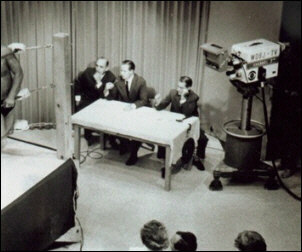 Television on channel 7 began in 1950, when Times World and the Polan Bros. of Huntington both applied for channel 7. Soon, the Polan Bros. instead filed a competing application for channel 10. The first station in the Roanoke valley, WROV-TV, went dark after only three months. Radio Roanoke (owner of WROV-AM 1240 and WROV-FM 103.7) filed a competing application for channel 7. Eventually, it was resolved with an agreement that Times World (owner of WDBJ-AM 960 and WDBJ-FM 94.9) would buy the UHF equipment of the now-dark WROV-TV, and in exchange Radio Roanoke would withdraw their application. October 3, 1955: WDBJ-7 signed on from Mill Mountain with studios in the Mountain Trust Bank Building. 1956: WDBJ-7 moved to studios in the Times World building. 1957: WDBJ-7 moved to a transmitter on Poor Mountain. 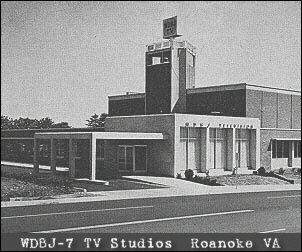 1961: WDBJ-7 moved to studios on Colonial Avenue. 1969: WDBJ-7 was purchased by Schurz Communications of South Bend. April 20, 2002: WDBJ-7 moved to studios in its new "Digital Broadcast Center" on Hershburger Road. April 30, 2002: WDBJ-DT signed on with a full-powered signal, 12 hours per day. From day one, WDBJ has been a leader in digital television. 2003: WDBJ-DT began running a 24-hour schedule. 2004: WDBJ became the first in the market to invest in high-definition recording equipment. This allows them to air a selection of movies from Paramount in high-definition.